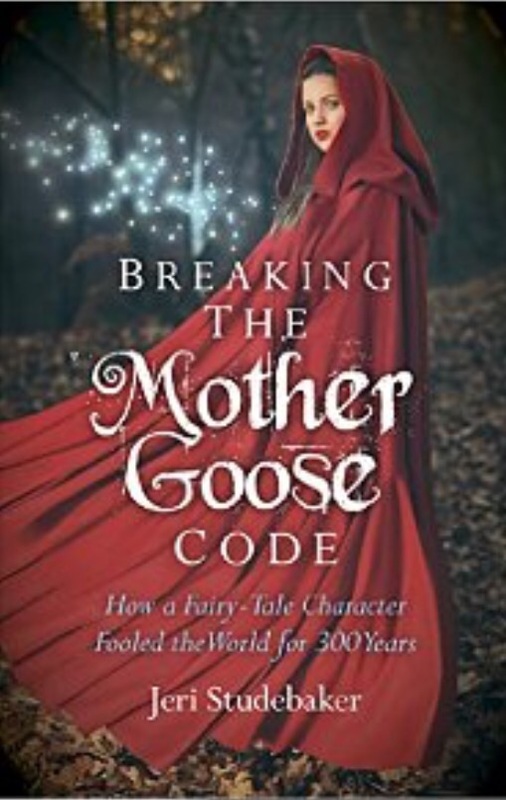 This is a fascinating book involving detection, ancient practices, fairy tales, nursery rhymes, our ancestors and goddesses, all revolving around the tale of Mother Goose. Basing her ideas around two main theories 1) that Mother Goose was a European goddess in disguise and 2) that Mother Goose appeared from nowhere at the time that European Pre Christians were being dealt a final blow with inquisitions and witch burnings, Studebaker sets out to prove that hidden within Mother Goose was in fact a goddess, a way of disguising the evidence until it was safe to reveal it. The goddesses Holda-Perchta, Aphrodite and Brigid are all among those considered to be the goddess depicted by Mother Goose. Painstaking research and a creative and delving mind are put to task in teasing out links however tenuous at first in order to support her hypothesis and then the wider field of the purpose of fairy tales. The author also looks at the secrets that are hidden in nursery rhymes of the time and in the second part of the book, at other early or Pre-patriarchal fairy tales and the various theories over their purpose in society as well as their common characteristics and proposing her own ‘secret code theory’. 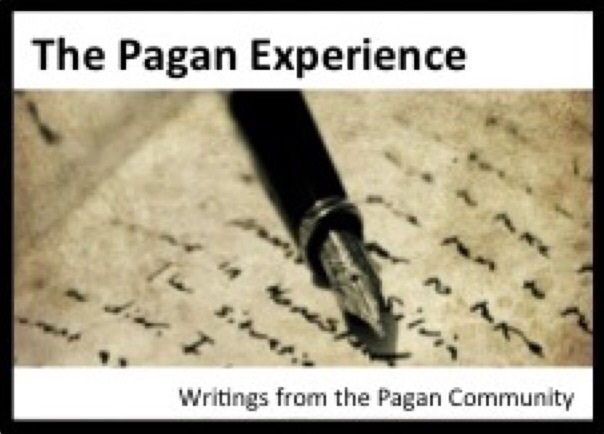 Finally, over several chapters she looks at specific European fairy tales and the information they provide about our goddess centred ancestors. I have no memory of the Mother Goose tale as set out in this book, nor have I more than a passing knowledge of goddesses, this however did nothing to lessen my interest, particularly in the second part of the book where I found myself totally caught up in the world of my ancestors as disguised in fairy tales. Imbolc is approaching fast so I thought I’d share with you some of the things that myself and a few of my fellow authors at Moon Books will be doing at the weekend. Last week I was asked a question about the cards I worked with to find the teacher/connection for these posts. I was asked if I used images cut from magazines. As you can see the answer is no. These are not my personal cards, the ones I work with when I am either planning a path for myself or looking for insight from my own teachers into something that has happened, I will post about them another week so you can see the difference. The cards you see pictured here are the ones that I use for quick inspiration, insight and messages from connections which for me at least are not my own personal teachers. To find the connections for these cards I brainstormed all the possible connections that I could think of. Now if you bear in mind that everything that exists is interconnected and can communicate, you will understand that these are only a very small selection of all the connections that exist, however I needed this to be workable and also to be able to start somewhere. I also have blank cards set up on the computer so I can add to them if I come across a new connection that resonates in some way. 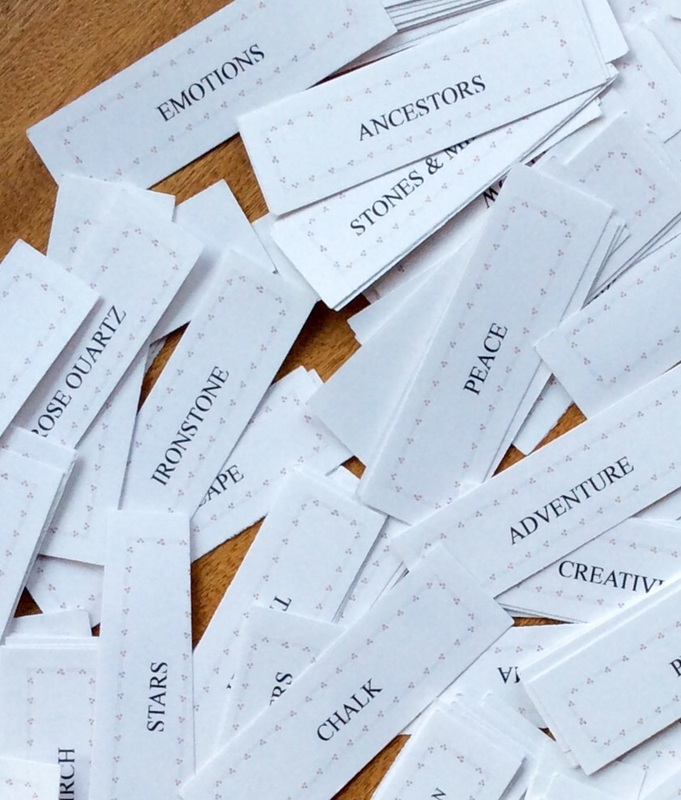 It is these cards that live in a bag and which I delve into once a week or so to find a connection or teacher that has a message for us. There is no reason why you can’t make your own set, using connections that come to mind for you. Mine have a fancy border and were produced on the computer then printed, because that’s what I was drawn to do. They could just as easily be hand written and on plain card though. For this the energy is in the connection and the message it brings not the way it was made. It might be fun, or if you are just starting out it could be helpful, to make a card of each connection that I draw and then sit with it yourself and see if you too can get a message. It would be interesting to see how similar or different the messages you get to the ones that I do so perhaps if you feel drawn to do this you could share your message in the comments. Or you could make a whole set to work with for your own inspiration and insight. 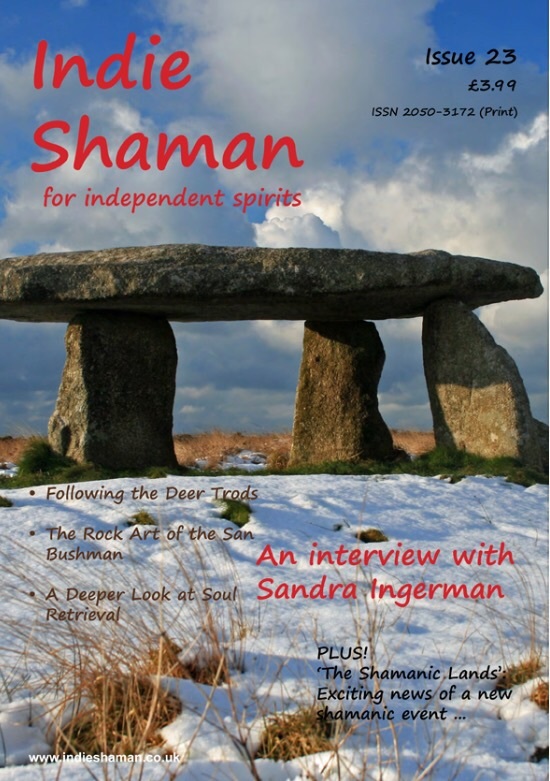 If you like the way I write you might be interested in an article I have in the latest copy of Indie Shaman magazine, it’s about the rock art of the San Bushman in Namibia. I also have a brand new column in the magazine starting in this issue. It’s called Shaman Moon. The only thing an altar should be is a special place to you, other than that it can be anything and be anywhere e.g. in the house, in a special room, on a shelf, in a window, on the floor, or even outside in nature. It can change whenever it needs to change such as over time as you change, with the seasons or with each turn of the wheel of the year. It can be a place where you go to connect with something e.g. spirits, the divine, with your ancestors, or with yourself. It can be a place where you worship or simply a place you like to visit. The photo on here is of my own altar. It is basically the top shelf of a bookcase in my healing room. Despite having a Cambodian Buddha on it, my altar is not somewhere that I go to worship for I do not worship gods, goddesses or any spirit come to that. My altar is a place where I keep some of the things that are important to me and this includes some of the tools whose spirits I work with. All of the items there are present because their energy makes a positive contribution in some way. The Buddha is on my altar simply because I like its energy and the peace it brings me when I look at it. The Buddhist prayer wheel is from Nepal which brings back memories, also I love the idea that inside it is the Buddhist peace prayer and that every spin of the wheel sends out the prayer 10,000 times to the world. Tucked in between the prayer wheel and the Buddha is a Reiki crystal which was a present from one of my students. The shape and energy of the crystal remind me of the purity of the energy of Reiki and the gift of being able to work with it and pass it on to others. The key on the blue ribbon was also a present. On it is inscribed that it is a journeying key and this reflects another very important area of my life, that of shamanism. At the back are two fetishes from the witch’s market in Peru, a sun which, along with the small candle, represents the element Fire and the Condor which came from a witch who told me it was for a traveller. It also balances the energy of Eagle which is here in the small bundle of eagle feathers at the front right. I have other feathers there too, the large feather is from Condor and was another gift. Its spirit works with me in many ways including realigning, clearing and smoothing the energy field. There are other feathers here but the remaining feather that can be clearly seen is Owl. This was a gift at a time of initiation and its spirit now works with me usually at times of initiation of others. Feathers also represent the element Air whereas the various stones that can be seen on my altar represent the energy of Earth. I know how important it is for me to have balance in the energy of elements so also on my altar is, but perhaps not visible here, a shell which represents the element Water. There are other items on my altar but I am sure that by now you get the idea. Sometimes I add to my altar, sometimes I take away. The cloth and colour of cloth changes often but there is no regular pattern to the changes. Some items are always there, some shift in and out depending on what I need. 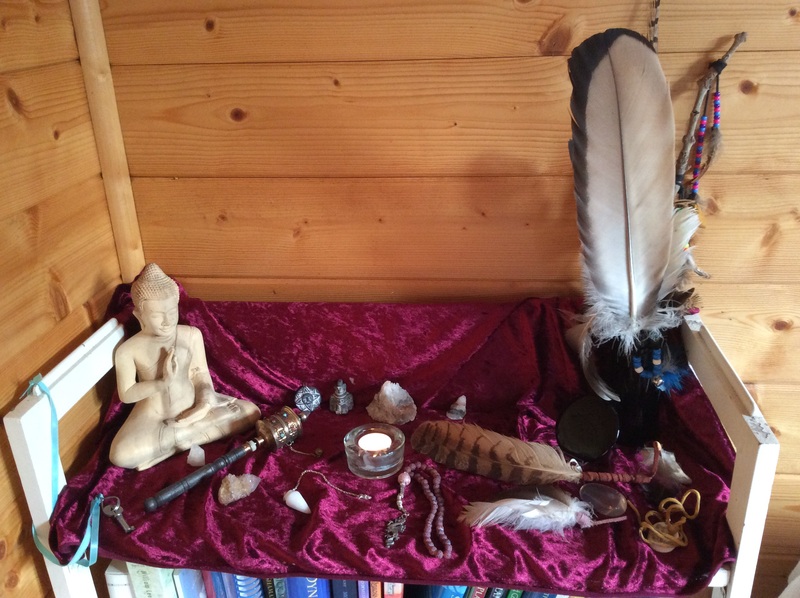 I always check the energy of the placing of things on my altar and while it may not always look amazing, the energy of it is always perfect for me and the space it is in. One thing I hadn’t realised until I was writing this is how many of the items on my altar have been gifted to me. This does not have to be so but is how it is for me, at the moment anyway. There are no rules about altars, no right or wrong, so creating an altar is always a very personal activity and reflects the person who has created it, their energy, their beliefs and what is important to them. I love how drawing one of the cards that I made for inspiration when writing Web of Life can so often bring me exactly what I need and that the messages I get resonate with others too. Today’s card was RED and even before I connect to it I am getting feelings of warmth, comfort and I can feel just the thought of RED lifting my energy. Often when we stand in front of our wardrobes and choose what to wear by the colour of it, or find ourselves in a shop picking up clothing or something for the home in a colour we might not have chosen it can be because we need the vibration of that colour to feed our energy in some way. ‘Like the warmth of a summer’s day let the vibration of RED fill you from head to toe, let it flow through you warming and energising your being. 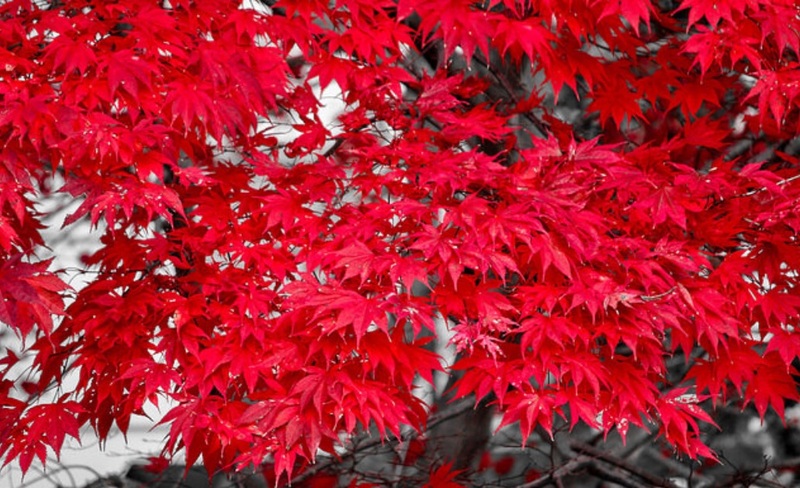 Breathe in the energy of RED and feel it lift your spirits’. It’s too cold not to have gloves on inside so I can’t paint or draw easily. Nothing there to really explain the feeling then but maybe that is just it. Perhaps it is never really any one thing that contributes to how we feel, rather lots of small things that when they come together have a positive or negative effect on our well being. I am lucky in that I know this will pass quickly and probably by the time this is posted I will be feeling more like my normal self but I do pay attention to how I am feeling and recognise the signs. At this time of year especially, many people are prone to feeling down or low. Grey overcast days, cold weather, snow, ice, winds, lack of energy, lack of money, lack of sunshine, lack of anything really, all take their toll. Yesterday was a firm reminder of how easy it is to slip into a blue funk. I have several go to remedies that I can use when feeling this way. One is to treat myself with Reiki, especially working around my head in particular the back of my head over the occipital bones which are release points in many complimentary therapies. A second is to take some Waratah, one of the Australian Bush Flower Essences which is a fast working essence for the ‘dark night of the soul’. A third is to have a good laugh and cheer myself up, there is bound to be a video on Facebook that will make me smile or even laugh if there is no one about to help. A fourth is to wrap myself up and go out into nature to wake myself up and energise myself. A fifth is to write about how I am feeling which helps put it all in perspective – hence why I have written this. I am not for one minute suggesting that any of these are magic solutions for anyone seriously depressed but we all have days when we feel down and on days like these we can help ourselves if we try and if we do so, we can stop ourselves slipping any further or getting stuck here.